Method : Treble the rope parts in your hand and hook an overhand loop onto the uppermost bight (1). A trade trick is to put one or two twists into the long bight (2) before doing anything else, to prevent the knot from spilling as you pull it taut and take up the slack (known as swigging). Now pull a bight of the free line through the twisted bight, pass it around a convenient anchorage, and pull (3). Lead the line around the next anchorage point and repeat the process. History : The other name for this contrivance is the waggoner's hitch, which implies that it is as old as carts and carriages. The first part of the knot (1) is the bell‑ ringer's knot, described as early as 1815. My father used to use this knot to rope and tie down tarpaulins on lorries (now called trucks!) many years ago. He called it a Liverpool hitch - named for the Port of the same name in the north of England. 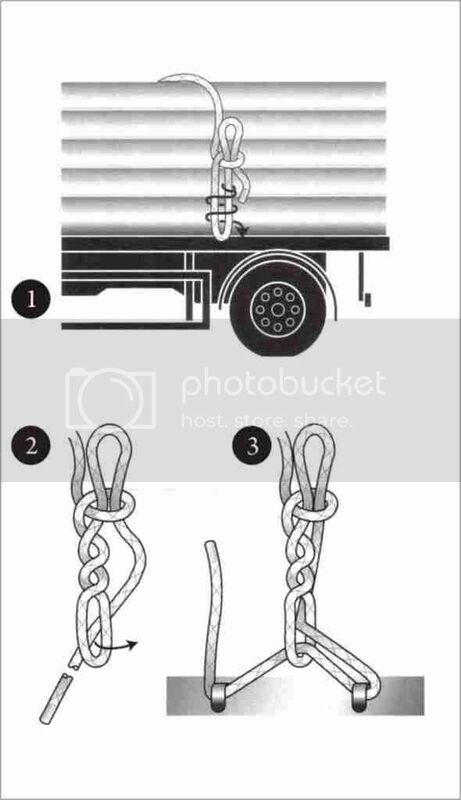 PLEASE do not confuse this with the other trucker's hitch which involves a slip knot/slippery hitch which can be very difficult to untie - particularly with today's synthetic ropes!